Q. I’m so frustrated with the ‘Forever Pink’ hydrangea bushes I planted four years ago that I’m tempted to rip them out and plant something in their place next spring! My sister has at least six of these plants in her garden outside of Stony Brook (on Long Island). Hers are absolutely spectacular when we visit each summer and she doesn’t touch them – ever! Meanwhile, my plants get so big that I have to cut parts of them back each autumn to get into the side door of our garage, but they produce only a few scattered blooms each summer. You’re their last hope! Any suggestions? A. 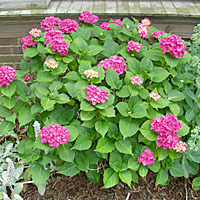 'Forever Pink’ is a hortensia, or "mophead"-type cultivated variety of bigleaf hydrangea (Hydrangea macrophylla). In my experience this plant only grows three to four feet tall and wide in upstate New York. So if they're getting too big, you must've planted them within a foot or two of your garage door? Regardless, it's important to understand that bigleaf hydrangeas, including your `Forever Pink,' the ever popular `Nikko Blue,' below left, and others set flower buds for the following year at the tips of the current season’s growth. This process takes place as days start getting noticeably shorter from August into October. Therefore, it’s immediately obvious that one reason your plants aren't producing flowers is that you’ve been cutting off the flower bud-bearing stems each autumn so that you can get into your garage! Also, while bigleaf hydrangea plants are tolerant of temperatures far below zero, the flower buds at the ends of their stems are more cold-sensitive, and are often killed when temperatures drop to near 0°F, especially shortly after common midwinter thaws. Therefore, it’s possible/likely that any flower buds that escaped your past pruning efforts were killed by bitter winter temperatures. My recommendation is to transplant your hydrangeas to a spot where they can grow without annual pruning as soon as the ground thaws next spring. The location receive at least a half day of direct sunlight (full sun is best), have soils that are well-drained, and should be protected from bitter winter winds. Then, be patient. It may take several years for your plants to recover from being transplanted and develop mature stems capable of producing flower buds. You may also want to shovel powdery snow over the plants each winter in an attempt to insulate the flower buds from the most bitter weather? And, if for some reason you need to prune these plants in the future, do it no later than the middle of July to reduce the chance of cutting off next year's flower buds! With this extra effort, you may be more successful in coaxing more blooms from this plant in the future? Finally, replace your `Forever Pink' hydrangea with `Endless Summer' hydrangea. Just make sure to plant it about three feet from the door to your garage!